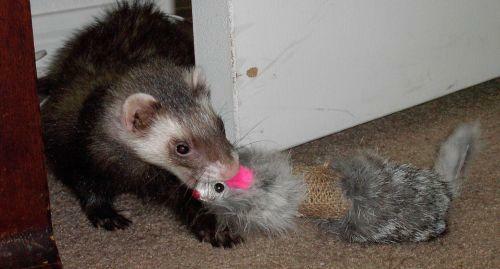 Nothing excites a ferret's hunting instincts like a furry toy; a moving target rivets their limited attention span. 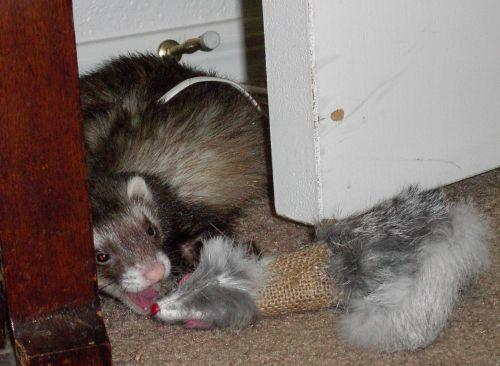 Nessie (upper left) and Gracie used to mop the floor with this little baby ferret toy, just like they used to with baby ferrets Smokie and Coco, respectively. Put that little sucker on a string and you've got hours of entertainment. 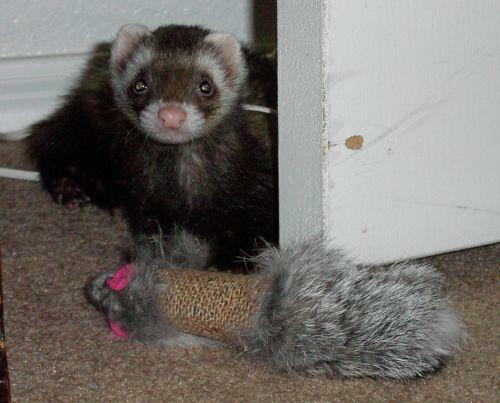 Actually, put almost anything on a string...a pen cap, some feathers, a Garand clip--you've got your fuzzy buddy's attention. I had a plastic spider hung from a stick with some string and ran some great steeplechase races in the ferret room. I made sure to drag it up over boxes, their carrier...too bad I couldn't run it through their PVC tunnels. They got good exercise and I got entertainment watching them compete for the chance to nab the spider. When I had the hallway closed off, they had even more room to bound through, plus Gracie's Fortress of Solitude beneath the overstuffed chair in the other bedroom. That's where she'd drag her toy once I released the stick and then she'd begin to gnaw. Of course, she always left the stick poking out, so it was just a matter starting a game of tug o' war. More fun!